The Tax Cuts and Jobs Act (TCJA) has many facets affecting all kinds of tax law. One of the changes that doesn’t get the spotlight all that much, but is just as important, is alimony. For those in the process of finalizing their divorce, the new tax rules may compel you to either close it out before 2019 or wait to sign on the dotted line. 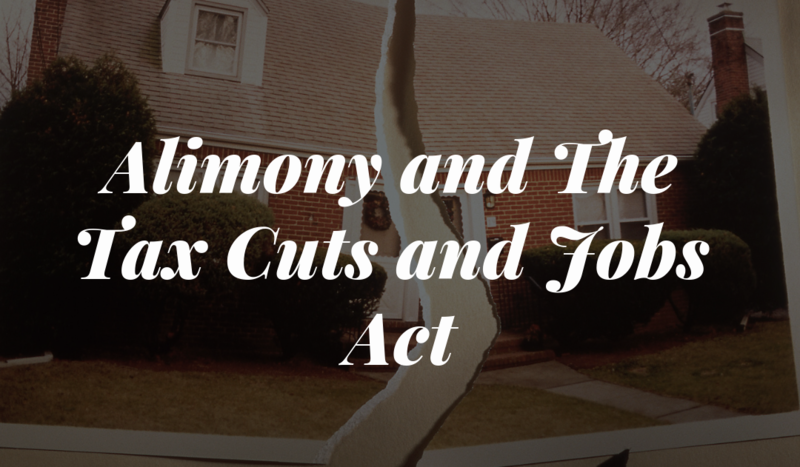 In this article, we’ll go over what counts as alimony payments as well as the tax rules before and after the TCJA. Under the old tax law, alimony payments are taxable income to the spouse receiving the payment and deductible by the spouse paying it. This will continue to apply indefinitely to all divorce agreements signed before January 1st, 2019. In other words, if your divorce agreement is signed before 2019 then the new alimony rules will not apply to you. Remember, you don’t explicitly need an alimony judgment before year end. The rules permit you to sign a marital settlement agreement before December 31st and utilize the current tax law. Under new law, alimony payments are neither taxable to the receiving spouse nor deductible by the paying spouse. This only applies to divorce agreements signed after 2018. For the most part, the higher income-earning spouse is the one paying the alimony to the spouse with less income. Thus, this new rule shifts the tax burden onto the spouse with more income because they are no longer allowed to take the deduction. Remember that this new law does not change divorce agreements signed before 2019; it only applies to final agreements signed in 2019. However, it is possible to modify an old alimony agreement in 2019 to confirm to the new TJCA alimony rules. With the consent of both parties, the modified agreement must specifically state that the TCJA treatment of alimony is being applied. One other exception to take note of is that the new alimony law will not affect California residents on the state level. California does not conform with many of the TCJA provisions, including the new alimony rules. Because of this, California still allows for a deduction to be taken by the payor while maintaining that the payee must report alimony as income. While there are certainly larger, more noteworthy changes in the Tax Cut and Jobs Act, this change is sure to affect people throughout the country. For this reason, there are an ample amount of people that should be paying close attention to this new law and perhaps attempt to finalize their divorce before the 2019 deadline or delay it until after the deadline. Divorce is almost never an easy process, but being aware of all your options and their consequences can ensure you make the right calls. Is the Tax Cuts and Jobs Act a little much to take on by yourself? Need help getting your ducks in a row for the upcoming tax year? Call us today and get ready to take those taxes by storm.